The client is looking at launching it’s own driving school website with logo design for drivers, disabled drivers and drivers with learning difficulties in Auckland region. To emphasize the message that Polo Driving School is a car driving school for the physically challenged, we incorporated the wheelchair into the steering wheel. Making the wheelchair visible will make anyone who checks their website understand their services at first glance. To highlight its being a car driving school, we made sure that the feel of the website will be like a road or a race track. 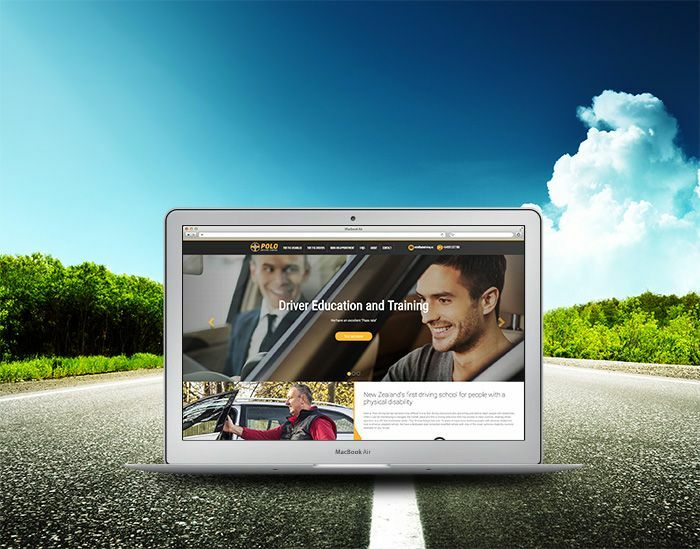 We also aimed to deliver encouragement and make users feel safe to try out their driving lessons. Drawing from that inspiration, we used the colors yellow and grey. We took maximum involvement in Polo Drive’s website improvement from planning to design and web development phases. We started with establishing the brand identity. This included choosing the color scheme, font size and images to be used. Next is creating the logo design. Through rigorous brainstorming, we came up with a logo that conveys the tagline, “a car driving school for the drivers and people with physical disability in Auckland.” Based on the brand identity and logo design, we designed and developed the website. *Note: There are several design, layout, and content changes in the website from our original design which we do not handle anymore.